On Saturday morning, June 16th, Principal Ana Hernandez and President/CEO Michael Anderer welcomed the inaugural class of students and families to Cristo Rey De La Salle High School to help answer questions about attending the newest private Catholic school opening in Oakland. Cristo Rey is founded on a simple idea––provide high school students of limited economic means access to a rigorous college preparatory education. 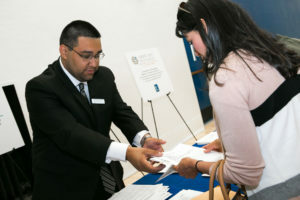 Despite the $18,000 tuition cost, through a unique funding model combining a Corporate Work Study Program along withScholarships Cristo Rey De La Salle students enter and graduate equipped with the tools to be successful and influential leaders in their community and beyond with minimal costs to their families. CRDLS is currently open for enrollment. Orientation was held on the newly renovated St. Elizabeth campus in the Fruitvale District of Oakland where it was the first time for many of the families on the former St. Elizabeth High School campus. Nearly 70 students along with their families attended orientation to learn about CRDLS’ unique academic model, its Lasallian principles rooted in social justice, and its innovative Corporate Work Study Program. CRDLS students were greeted by faculty and staff to help answer questions and assuage any concerns families might have. The day ended with a new student barbecue providing a chance for new students and their families to bond and relax with one another along with the CRDLS Faculty and Staff. Families learned that CRDLS has spent the last six-months renovating the one hundred year-old St. Elizabeth Campus to bring the school into the 21st Century with brand new furniture and individual devices to support the Personalized Learning academic model. CRDLS Personalized Learning model enables students to learn at their pace in a student-centered environment. By integrating technology as a tool to support student learning, the model allows students to create their own path with adults/instructors serving as mentors, facilitators, and coaches. Families learned that students and teachers work in partnership for weekly learning goals and check in to make sure students acquire and effectively apply the knowledge, attitudes, and skills necessary to understand and manage emotions; set and achieve positive goals; feel and show empathy for others; establish and maintain positive relationships; and make responsible decisions. Our Corporate Work Study Program Team provided students and their families an overview of the program offering insight into their very first professional work experience. Students will work one day a week in a variety of professional work environments: non-profit health systems such as Kaiser Permanente and Sutter Health; Fortune 500 companies such as Chevron, or nationally rank education centers such as Saint Mary’s College. This unique model allows students to implement in real-time what they are studying in the classroom along with our Corporate Partners who in turn, commit to paying $9,000 of the student’s tuition. By graduation, Cristo Rey De La Salle East Bay HS students will have gained four years of work experience and invaluable social currency. To help prepare our students for the CWSP, from July 9th-July 27th, the inaugural class will participate in the Summer Alpha Institute. ASI is a 3-week intensive academic and job training program for developing students’ talents and focusing their professional ambitions. It prepares each student for placement in entry level roles available through the CWSP. CRDLS families left orientation ready to take on a new model for learning and an innovative way to gain access to an excellent education.